I am saying my official goodbyes to my role heading the museum on this magnificent island of Norrbyskär. I am truly grateful to have been entrusted to manage this important cultural heritage that is a symbolic cornerstone in the welfare state the we enjoy in Sweden today. The saw-milling era at its prime in the 20s – 50s brought with it major changes- productivity, job creation, export opportunities and economic gain. Every journey one embarks upon will leave a trail. This one is mine. I have learned to appreciate even more so the benefits previous generations have paid the price for -controlled working hours and conditions, more favourable womens rights, childrens right to an education and controlled use of chemicals in industry. I have explored cultural avenues that I would have never dreamed of taking. I have stood before crowds of visitors and taken tours in a language that is not my mother tongue. I have made friends from all walks of life. A little piece of Norrbyskär always in my heart. I move on to continue working with women in Zambia with the vision of making a difference in their lives through Yawama of Sweden. My kids are no longer kids. How on earth did time fly? 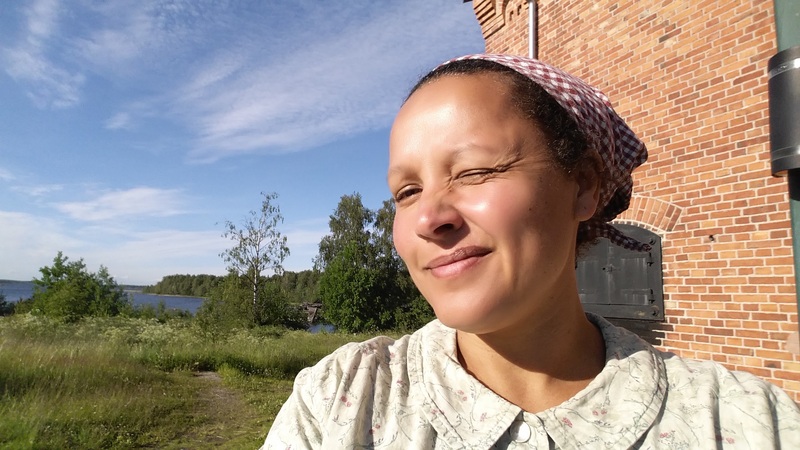 Moving from Zambia to Sweden 6 years ago was a decision we made so that they too could learn the language and connect with their swedish roots. We moved closer to their grandparents and we settled into a little industrial community on the outskirts of Umeå. Their childhood years on a small farm in Zambia happily dependant on mum and dad and the Zambian social network slowly replaced by small city life in Sweden and finding their own feet. Toys became more technical, clothes more branded, styles more varied in persuit of their own identity. Yes. I sometimes miss that village! I saw Nina Yesterday. I saw myself. 12 years old in a predominantly white boarding school in newly independent Zimbabwe standing up and saying. “ ENOUGH!!”. My fight then was for the right for blacks and whites to use the same showers.. to be able to stand in the same space. As I grew older my fight has evolved focusing on women who can’t own a space due to be being economically crippled. They are silenced. They are no one. They are part of this never ending malicious poverty trap. They are women in Zambia. Yawama of Sweden is my initiative born out of my numerous years in the aid sector wanting more than just hand outs for women. Wanting women to feel a sense of self worth. Wanting women to feel ownership. Wanting women to be economically independent. Wanting women to send their kids to school…..I could go on. This is what Yawama is about. I am so excited about the business growth that we are witnessing. The initial team of 5 knitters has grown and now more than 30 ladies are part of knitting and crocheting groups spread in the surrounding villages. Little Ndaba have developed the business model where women are now devided into piece makers and joiners. The piece makers work from home at specific meeting points in their different villages while the joiners work from Little Ndaba ensuring that the final toy is stitched and stuffed in accordance with EU regulations for toy safety. Little Ndaba coordinate yarn delivery and collection of knitted toys and conduct in field training. Each piece maker gets paid per completed set and the joiner is paid per completed toy. The ladies today receive the equivalent of 6-8% of the final price of each toy on the international market. Our ultimate goal provided we can are able to start bulk buying of yarn and start importing larger numbers of toys is 10%. This is a great business modell for the development of rural communities that I sincerely believe has the potential to provide many women with the possibilites of work outside of the farming season and is further independant of other household commitments. Many of the ladies are able to work from their homes or in smaller groups within the village setting. Smaller children can still be part of their mothers day. A short film about our latest trip to Zambia. I love seeing and listening to these ladies beautiful voices. Our recent trip to Zambia was as usual humbling and inspiring. This was Claras’ first visit to Zambia and our first day was spent with the widows from Chikumbuso. Chikumbuso always has an inviting and an incredibly peaceful environment and the women happily showed us around the facilities that show a well organised school for orphaned and underprivileged kids, a kitchen facility where lunches are provided for the students and the women and a small boarding facility. Our chikumbuso bags are crocheted here in Ngombe compound which is one of Lusakas’ largest slums. Our shweshwe range of bags and cushion covers are also sewn at the center. We continue to be inspired by these women and their determination to improve their lives. This has been an exciting and busy year with lots of additional ranges to our collections. We would love to celebrate by meeting you in Stockholm. Join us!